Sinusitis is the most common condition for which outpatient antibiotic therapy is prescribed in the United States.Wherever antibiotics are indicated for the treatment of acute bacterial sinusitis, the Infectious Diseases Society of America IDSAs evidence-based clinical practice guidelines recommends 5 to 7 days of therapy for patients.Dr.Laura M. King, at U.S. Centers for Disease Control and Prevention in Atlanta, and colleagues conducted a study and evaluated the duration of antibiotic therapy for acute sinusitis in adult outpatients.They have found that the duration of most courses of antibiotic therapy for adult outpatients with sinusitis exceeds guideline recommendations. More than two third of antibiotic courses and almost 91% on of non-azithromycin courses were being prescribed for more than 10 days.The findings of the study have been published online March 26 in JAMA Internal Medicine. The researchers studied the visits to physicians at which antibiotics were prescribed for sinusitis diagnoses were identified in the 2016 National Disease and Therapeutic Index. Antibiotics were categorized as penicillins, tetracyclines, fluoroquinolones, cephalosporins, azithromycin, or other. 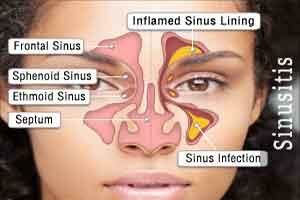 An estimated 3,696,976 visits at which antibiotic therapy was prescribed for sinusitis were included. The researchers found that the median duration of therapy was 10.0 days; most therapies (69.6 percent) were prescribed for 10 days or more. Excluding azithromycin prescriptions, 91.5, 7.6, and 0.5 percent of prescriptions were 10 days or more, seven days, and five days, respectively. “More than two-thirds of antibiotic courses and 91 percent of non-azithromycin antibiotic courses prescribed for the treatment of acute sinusitis in adults were 10 days or longer, even though the Infectious Diseases Society of America recommends five to seven days of therapy for uncomplicated cases,” the authors write.Earlier studies have shown that shorter duration of antibiotics (3-7 days ) in Sinusitis has been associated with equal outcomes and lesser side effects compared with longer duration (6-10 days ).